La Vista Del Sol Condominium offers buyers affordability with units recently selling under $200k. 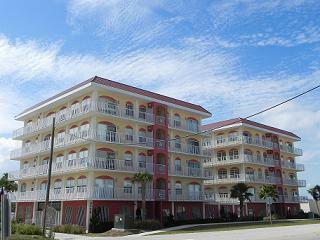 The complex is located on the west side of A1A in Daytona Beach Shores! Pet Policy - 2 pets up to 30 lbs. and a 1 month minimum rental policy. This 5 story 16 unit European style condo provides ocean and river views from a 500 sqft wrap around balcony. Each floor is only shared with only one other resident. Floor plans include 2 bedrooms and 2 bathrooms. Units feature solid wood cabinetry, granite counters, tiled baths and kitchens, luxury master baths and garden tubs, gated parking, and more! Private elevator entry with a key card will open directly to your unit.